Fiat debuts the 2019 Fiat 500X this week at the 2018 LA Auto Show. The new 500X has been redesigned, and offers numerous detail changes to make the car even more enjoyable to drive and live with. 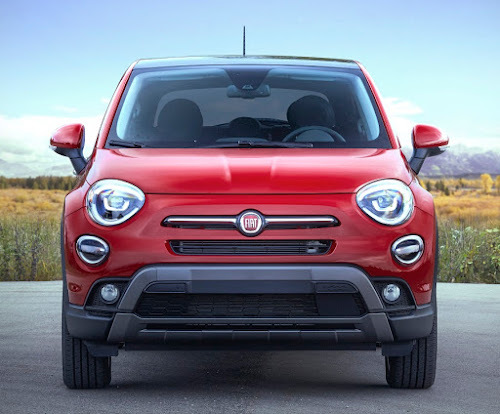 The 2019 500X is available in three trim levels:Pop, Trekking and Trekking Plus. 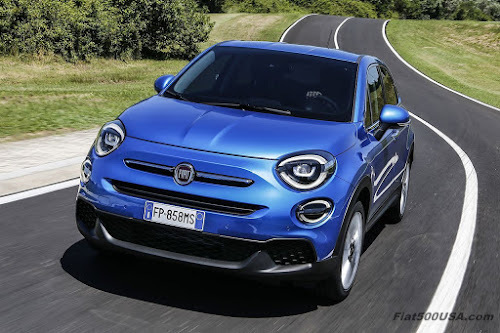 Gone for 2019 is the option of getting a 500X with front-wheel-drive. 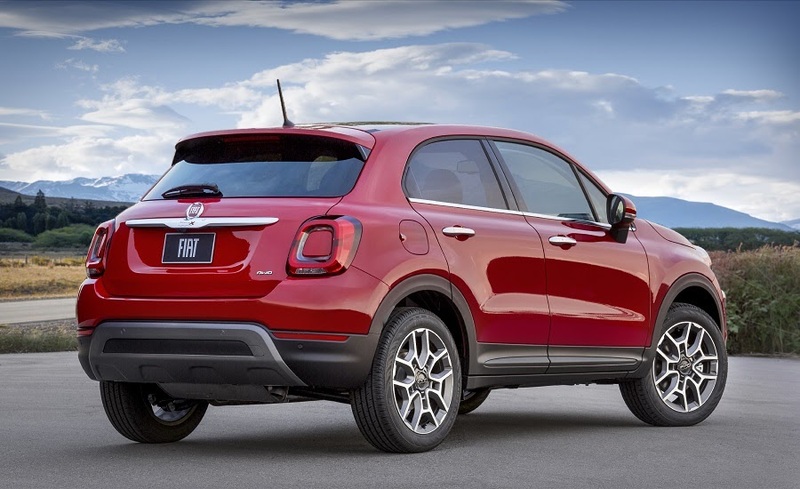 Now, all 500X models will be all-wheel-drive. Mechanically, the big news is the introduction of the new 1.3 Liter MultiAir III Turbo engine and the retiring of the 2.4L Tigershark engine used on previous AWD 500X models. This engine is from Fiat's new Firefly engine series that pushes engine design forward a couple of generations compared to the previously FIRE (Fully Integrated Robotized Engine) engine series. 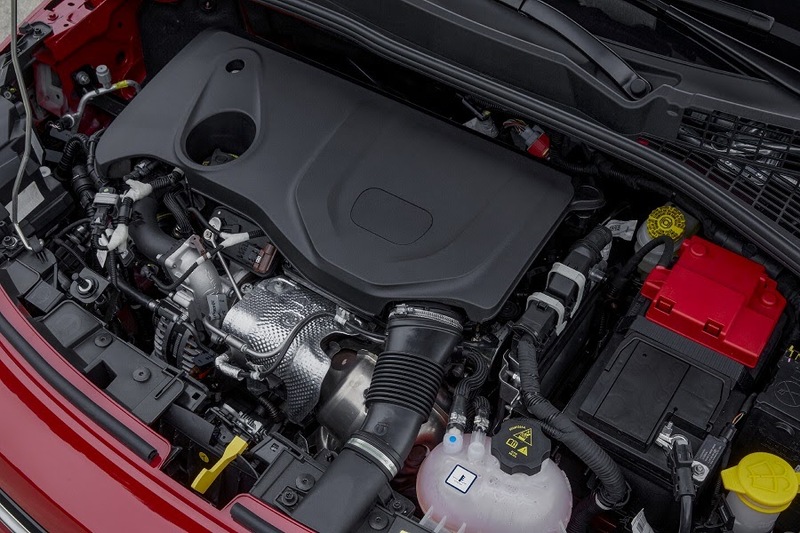 Key features of the new engine are excellent performance and NVH, high torque output and great gas mileage all while meeting ever tightening emission standards. 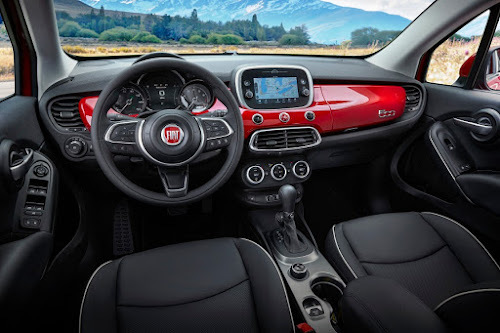 Design features include 4 cylinders, Direct injection, a 16 valve head with timing chain driven camshaft, aluminum construction with cast-in iron cylinders and Fiat's MultiAir III engine management system. 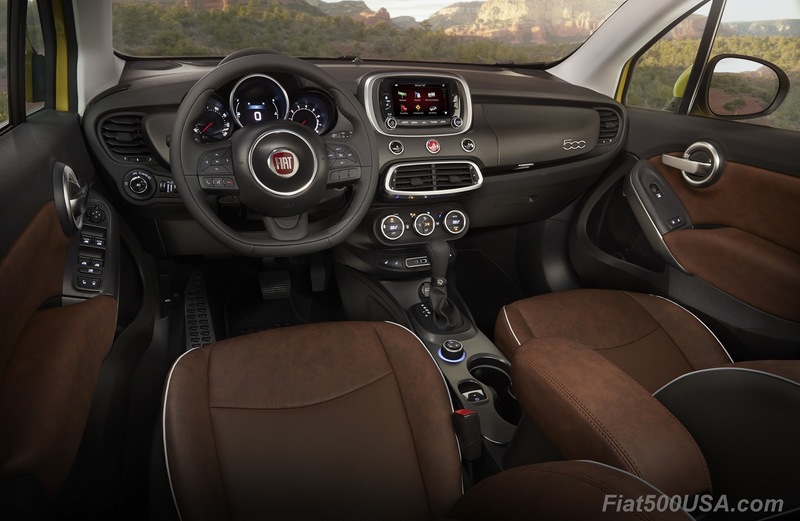 MultiAir III is the latest version of Fiat's award winning technology that is best described as variable valve-timing on steroids. 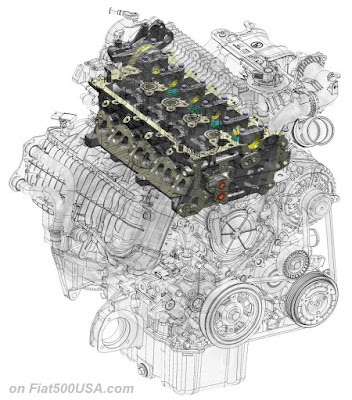 This new version allows the reduction of the real compression ratio by delaying valve closure, controlling knock and substantially improving fuel efficiency even at the highest loads. 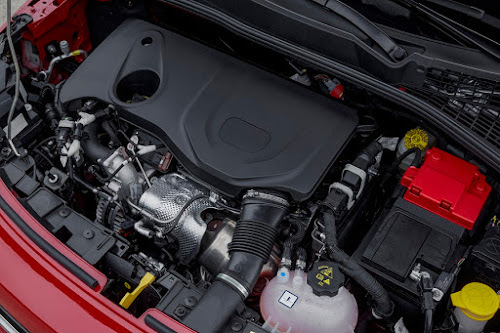 Turbocharger peak boost pressure is 2.7 bar / 39.7 psi. 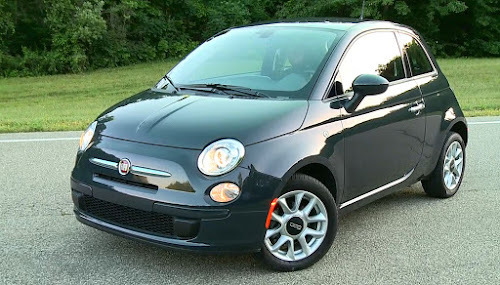 This smaller 1.3L outperforms the 2.4L by a wide margin. 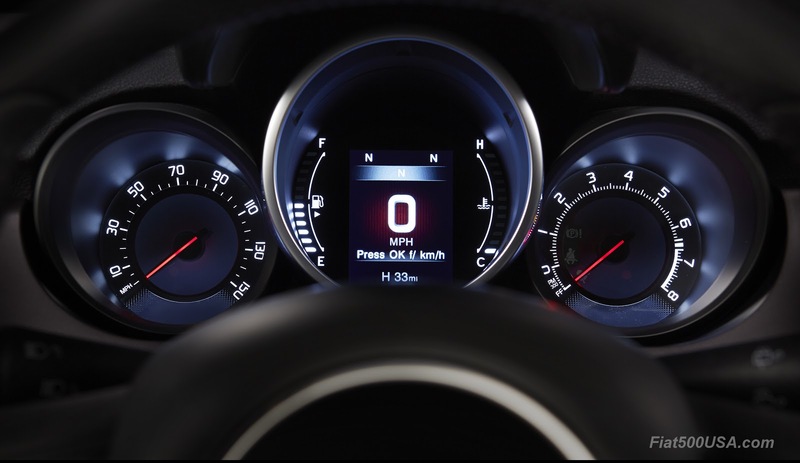 The 1.3L Firefly Turbo puts out 177hp @ 5,500rpm and arguably more important, a generous torque output of 210 lb.-ft. @ 2,200rpm. This compares to 180 hp @ 6,400 rpm and 175 lb.-ft. @ 3,900 rpm for the larger 2.4L engine. 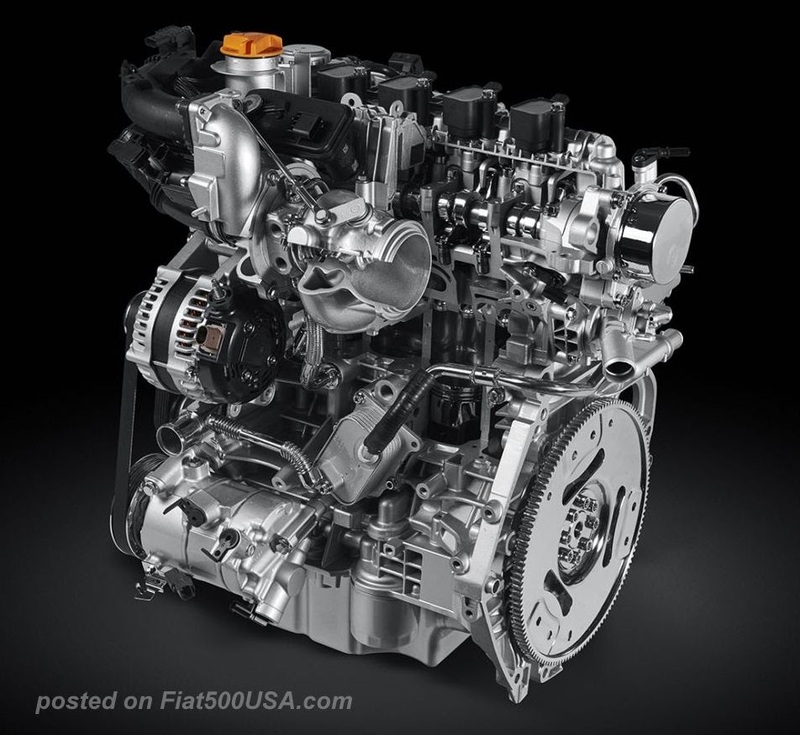 The 2019 500X now boasts the most engine torque in its class. This should improve and enhance low engine RPM drivability of the 500X when driving around in its higher gear ranges. 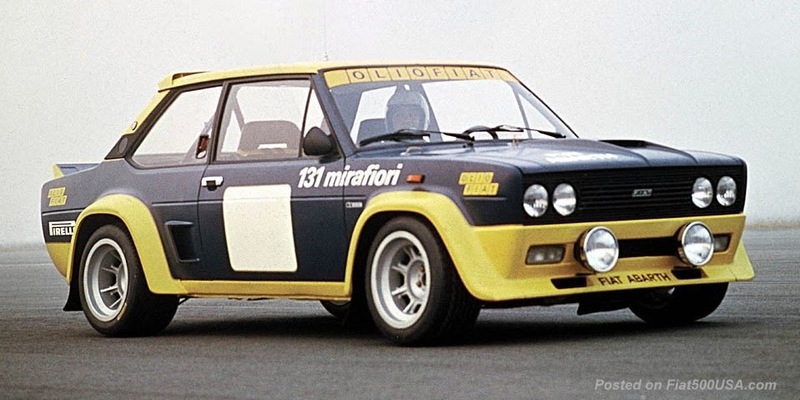 The 1.3L Firefly Turbo replaces the 1.4L MultiAir Turbo used in FWD 500X models of years passed. Expect the Firefly engine range to filter into the rest of the Fiat lineup. 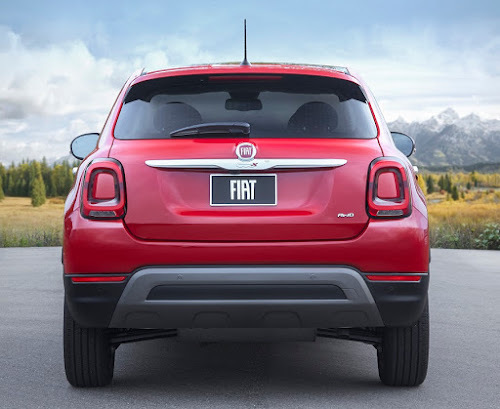 Look for the new 2019 Fiat 500X to hit showrooms this Spring. 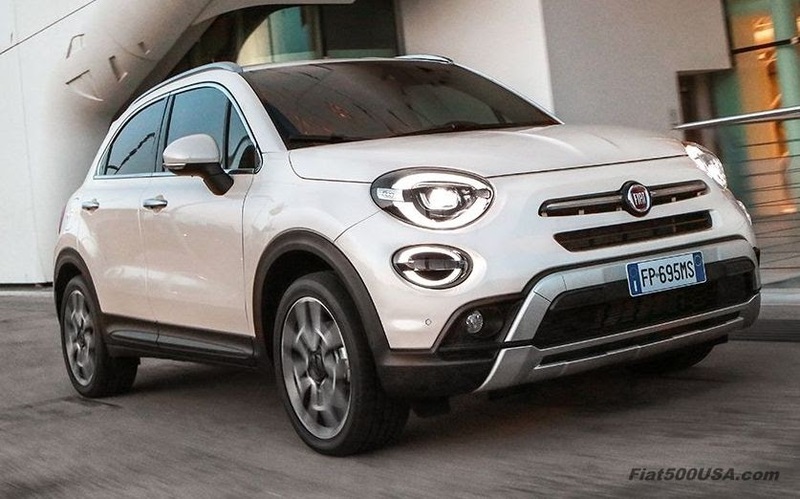 Below, we've put together some key comparisons between the new 2019 Fiat 500X and previous generation. 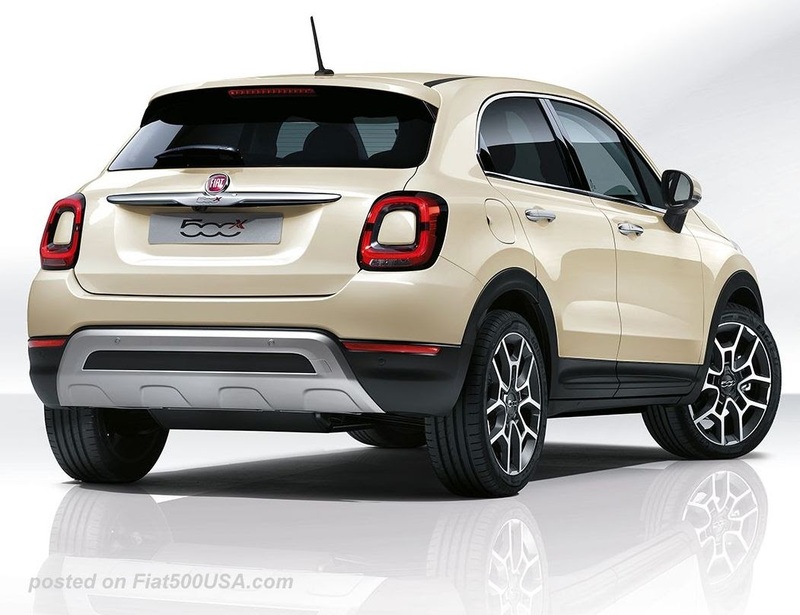 After the comparison, we have the full press release with all the details on the new 500X for you to enjoy. 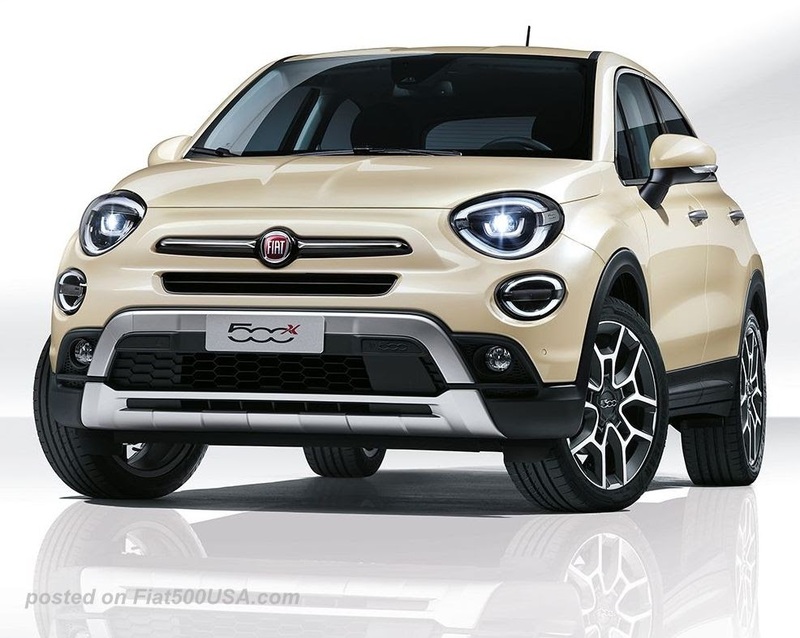 The 2019 Fiat 500X features a subtlety redesigned front fascia. 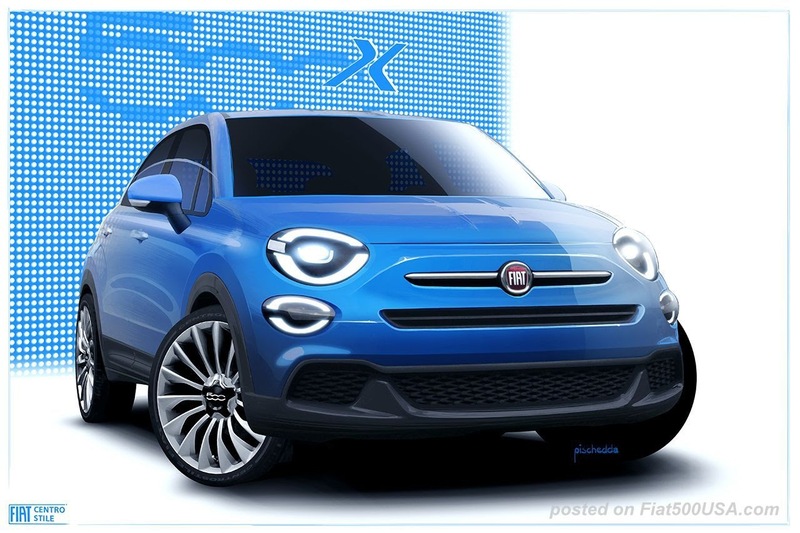 Comparing the 2016 500X front fascia shown below to the 2019 model, the most obvious change is the shape of the fog lights, which are now round instead of rhomboid and the new optional LED headlights. 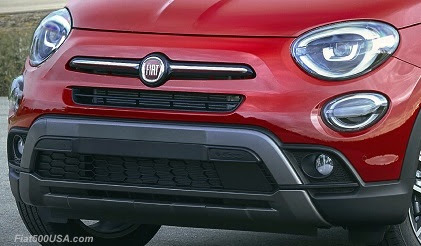 There are other detail changes, too, like how the sides of the faux push-bar now extends below the fascia and the bottom vents being more streamlined and less prominent. The 2016 Fiat 500X fascia. 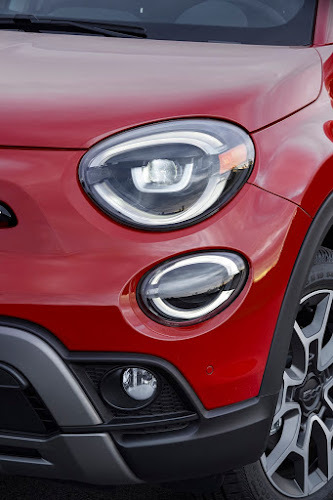 The 2019 Fiat 500X Trekking Plus models come standard with LED headlights which are optional on the base Trekking model. These powerful headlights provide daylight-like illumination and are 20% brighter than the Xenon lights the 500X came with in Europe, yet consume five times less energy than traditional halogen lights. 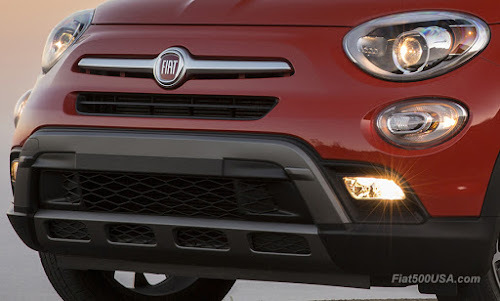 Other benefits of the 500X's LED headlights are reduced eye fatigue, as well as a wider vision area. 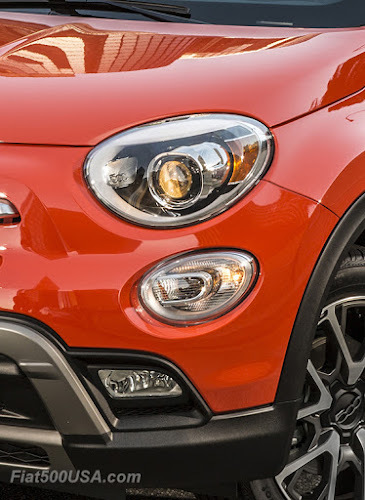 2016-18 Fiat 500X headlight were a bi-halogen projector beam design. 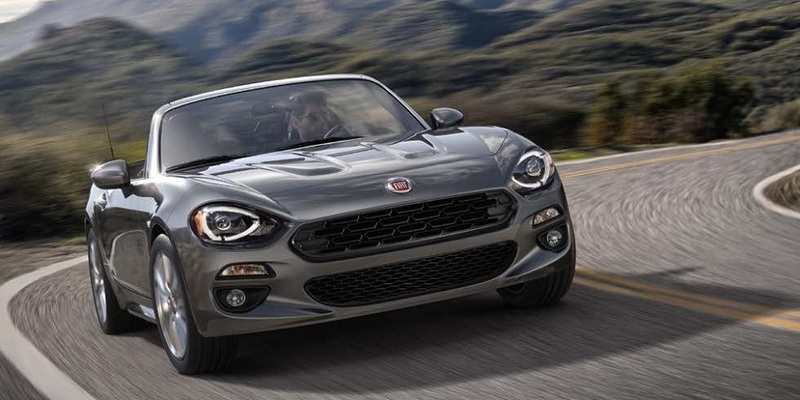 Bi-halogen headlights are carried over and are standard on 2019 Pop and Trekking models. 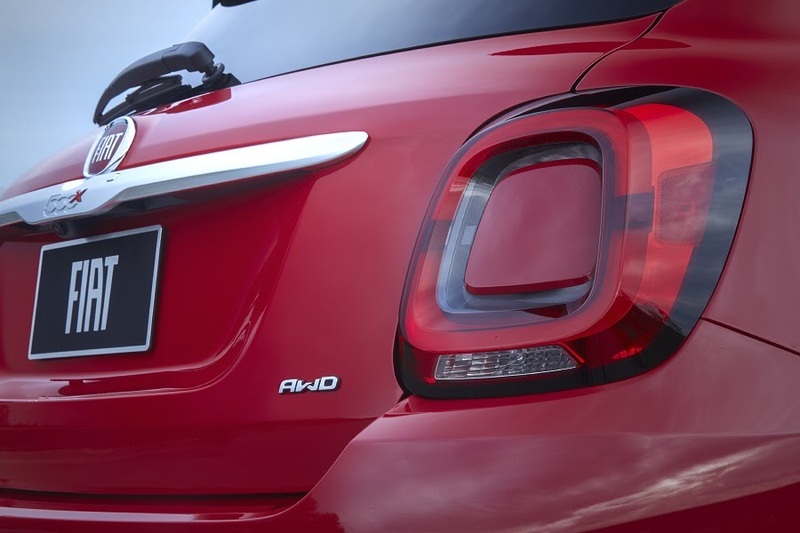 All 2019 500X models get new, LED tail lights. The previous 500X used this style taillight. 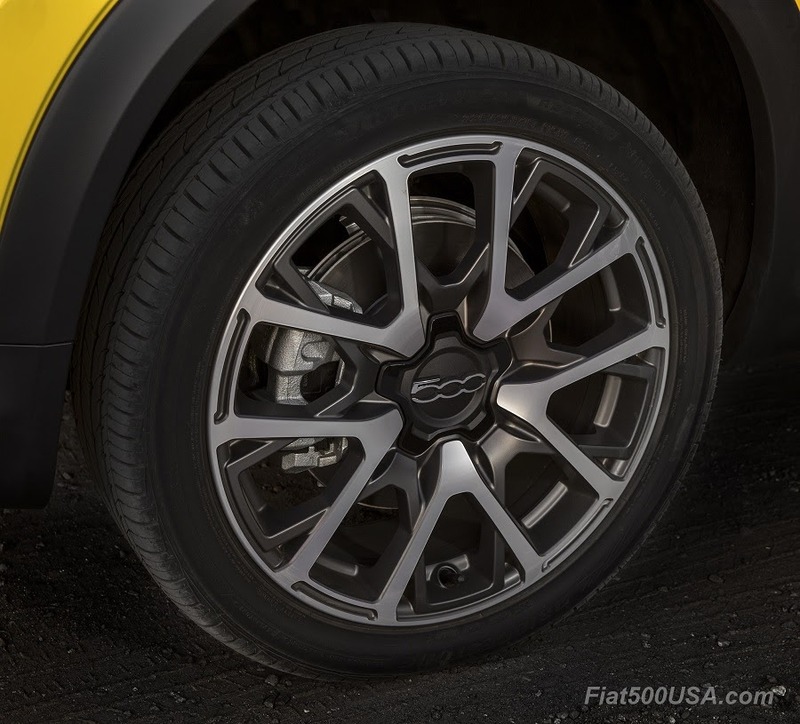 The 2019 500X wears new alloy wheels that resemble the look of the previous generation's wheel. 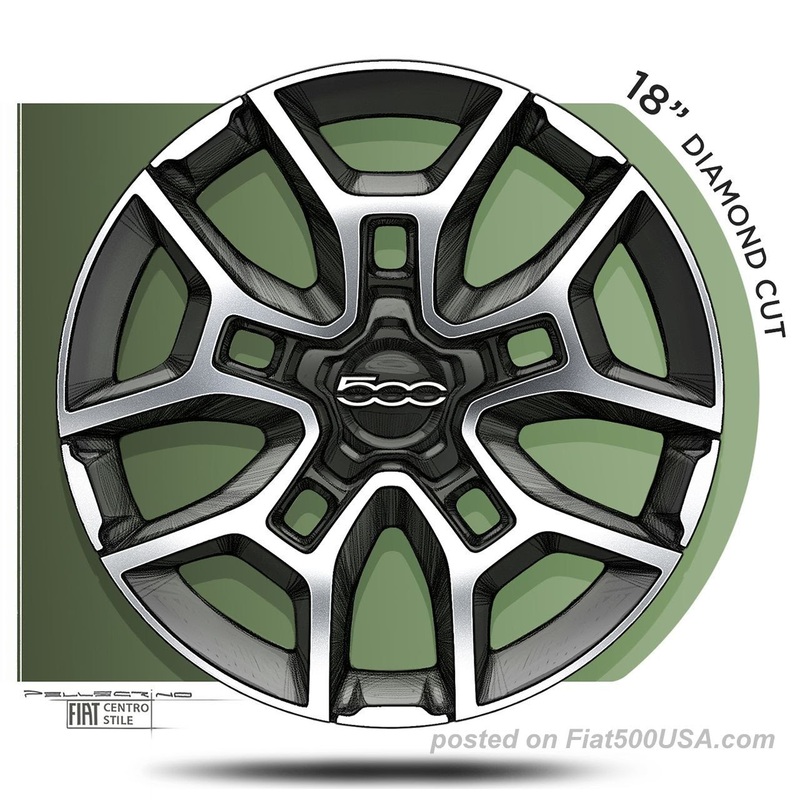 The new wheels have a simpler, yet still attractive design. 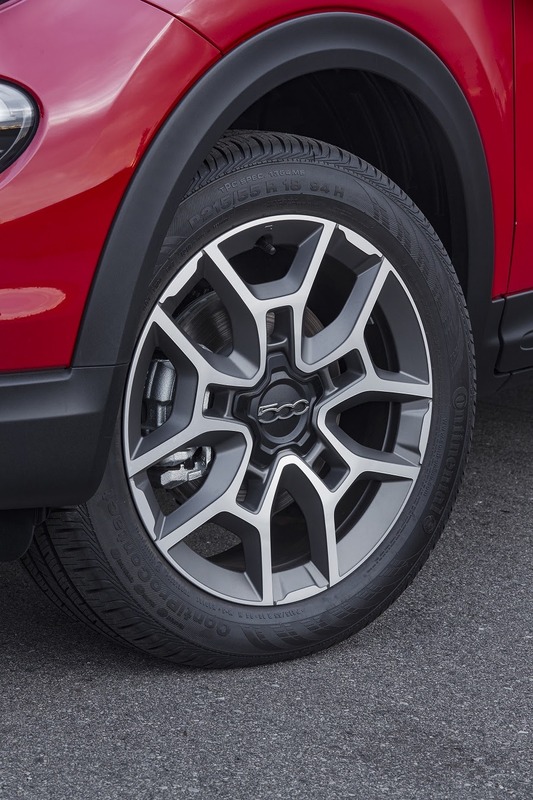 The previous alloy wheel used on Trekking Plus models. Interestingly, it looks like the center cap is the same on both the new and older wheels. More subtle changes for 2019 are a body colored dashboard on base Trekking models. 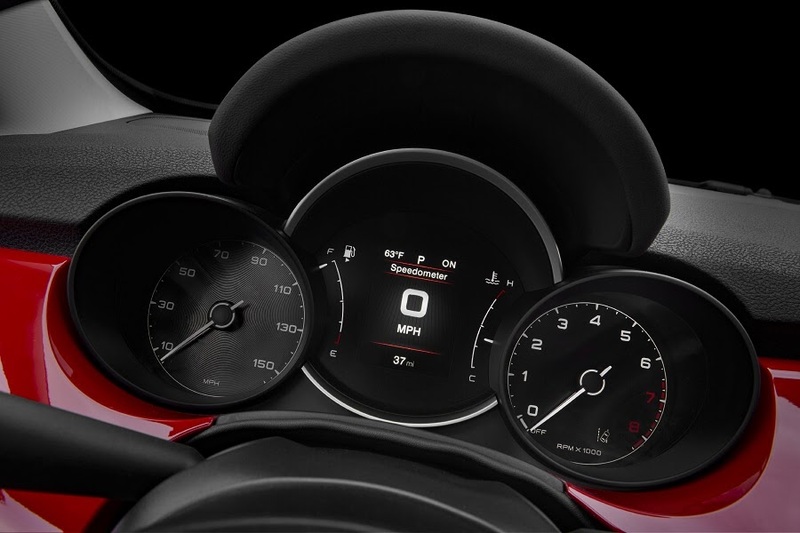 In previous years, Trekking models all had the matte accent dash panel shown below. This year, only Trekking Plus models will come with the matte dashboard. 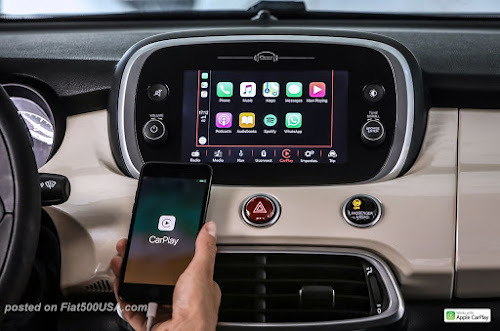 New for 2019 is a redesigned instrument cluster that is easier to read with clearer graphics and fonts. Instrumentation from the 2016 - 2018 500X. 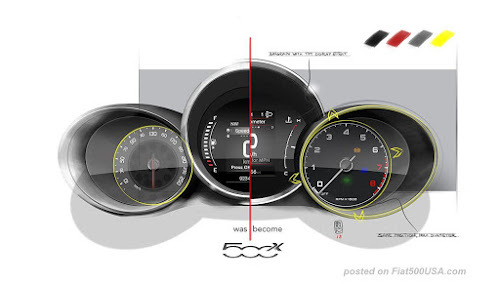 Side by side comparison of the old and new 500X instrument cluster. 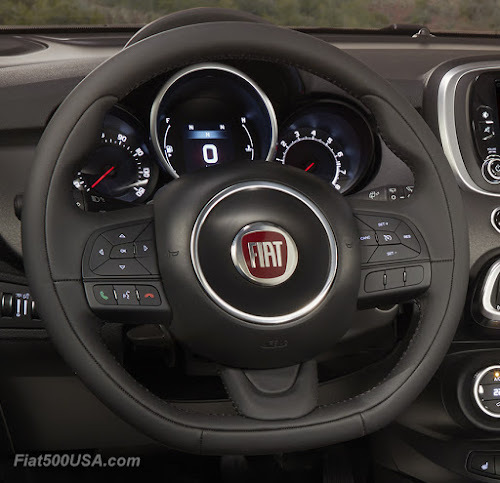 A new, redesigned steering wheel has been recontoured for better positioning of the driver's hands. 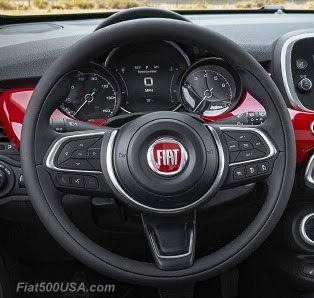 Gone is the flat-bottomed steering wheel. The wheel's design theme features bright trim and is similar to the one used on the 500L MPV and the redesigned 500 hatch and Cabrio models sold outside the USA. 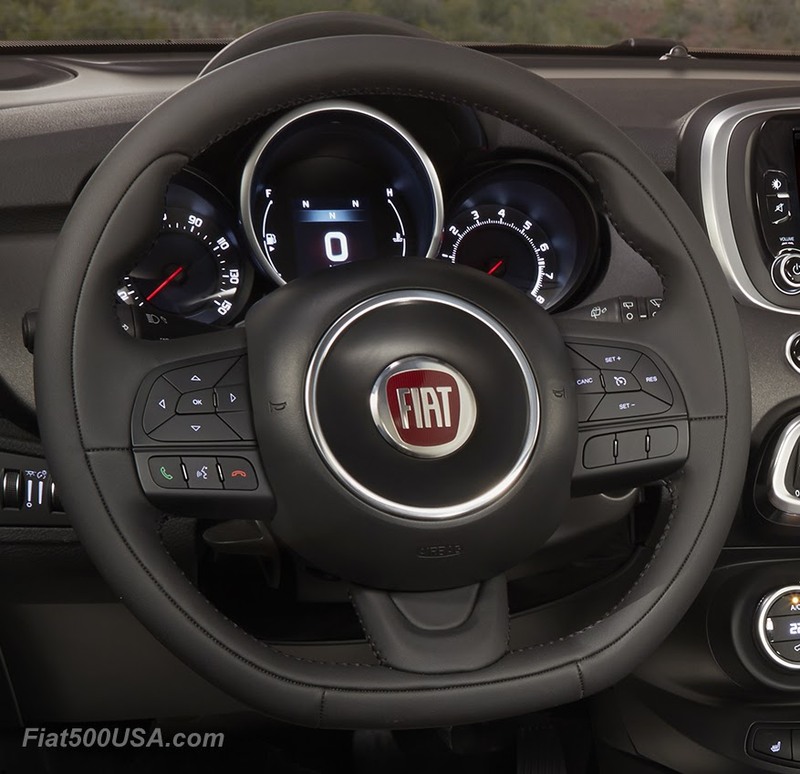 Comparing the 2019 500X steering wheel with the previous year's design, the new model's bright trim gives the car a more sophisticated and upmarket feel. 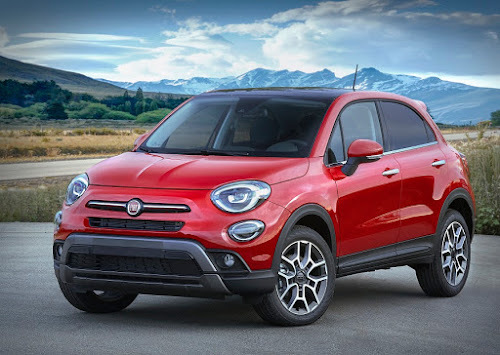 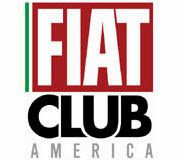 • New 2019 Fiat 500X powered by all-new 1.3-liter direct-injection turbocharged engine, which boasts 177 horsepower and a best-in-class torque rating of 210 lb.-ft.
November 26, 2018, Auburn Hills, Mich. - Powered by an all-new, fuel-efficient turbocharged engine and wrapped in head-turning Italian design, the new 2019 Fiat 500X will debut at the 2018 Los Angeles Auto Show. 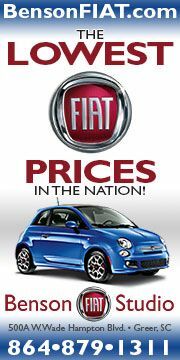 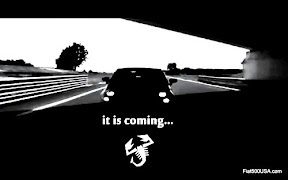 The Fiat Dynamic Selector System offers three customized modes for optimal driving performance. 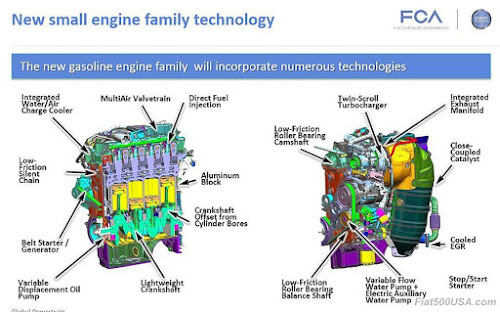 European model shown as representative image. 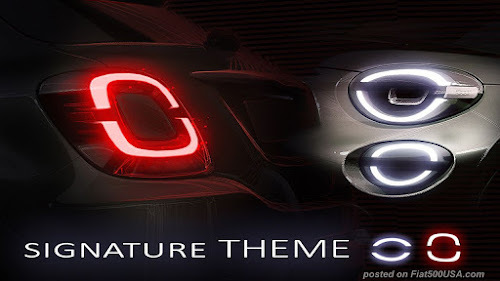 LED headlights are not available on Pop models. 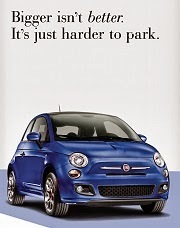 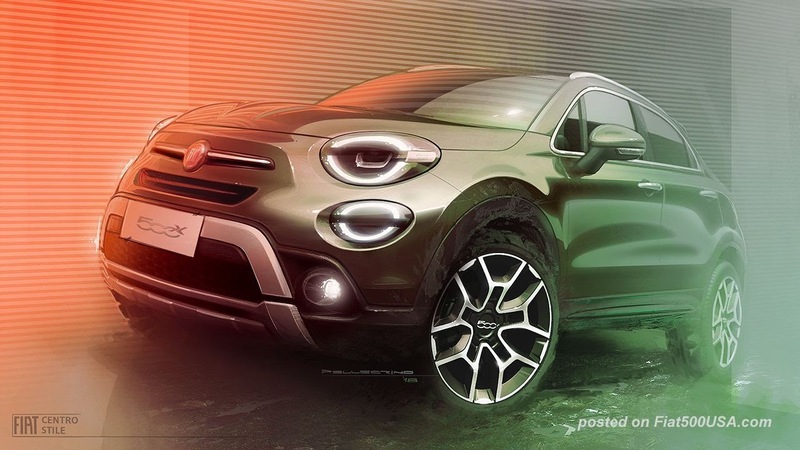 Fiat 500X Articles. Everything about the Fiat 500X!